I just added a new book to my library, by Barbara Carroll titled American Folk Art Rug Hooking, 18 folk art projects with Rug-Hooking Basics, Tips & Techniques. It's another book in the same vein as Pat Cross' Purely Primitive, Hooked Rugs from Wool, Yarn, and Homespun Scraps and Tara Darr's Wool Rug Hooking, Pillows, Footstools, Rugs. 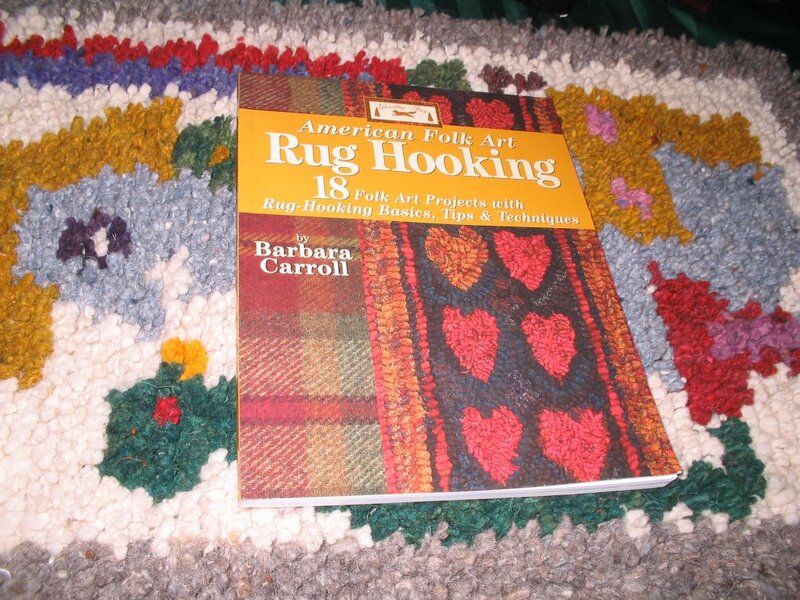 All three of these books would make wonderful gifts for the person who is just beginning their rug hooking adventure. They all offer great color pictures of primtive hooking, interesting information about the history of hooking,and patterns with instructions for hooking. Each of these books works like a visit with an interesting teacher. Add Deanne Fitzpatrick's book to the pile and maybe these books represent a new trend in the hooking community - a trend away from pre-printed patterns and toward hookers doing more independent work. I would still like to have someone else draw the pattern on the backing for me if I was planning to work on a very complicated pattern - Cumberland Crewel comes to mind - but I'm not likely to ever want to hook that style. I like the idea of beginners starting out right away with drawing their pattern on backing - even if it is a pattern designed by someone else - there is an aspect of owning their own work that is enhanced by doing it all from scratch. Well, come to think of it, it's really not a new trend at all. There are a lot of the old books that have patterns and instructions for hooking them, too - maybe the new trend is just the really flashy colored pictures - the pictures that cause me to pick up each of those books over and over again, even though I'm not planning to hook any of their patterns.